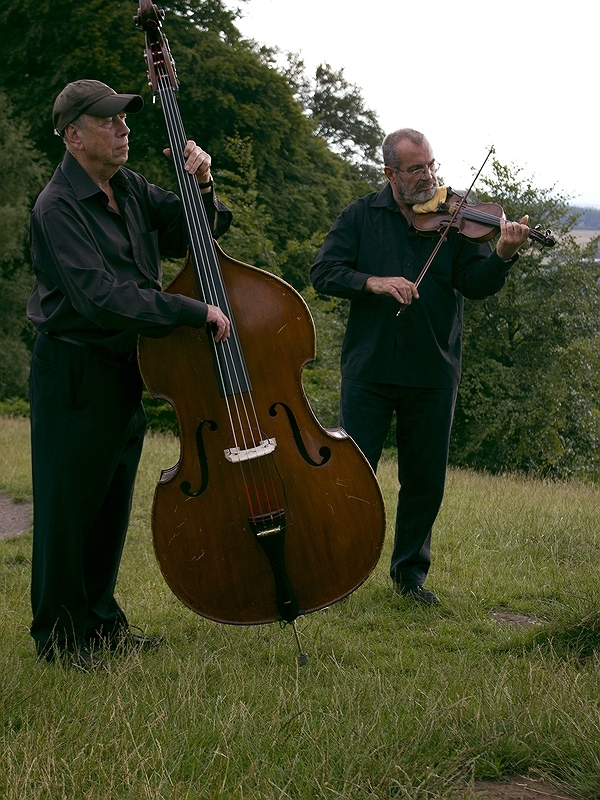 Catch Le Café Jazz playing Saturday Lunchtime Jazz this weekend at The Daffodil in Cheltenham on Saturday 21st July from 12.30 to 3.30pm. Take your time and tap your feet to excellent laid-back swing jazz as you enjoy memorable dishes and fabulous wine. You are also welcome to stop by the Circle Bar for a cocktail, and a bar menu is also available for those looking for a quick snack. Take a leisurely lunch in sumptuous Art Deco surroundings while listening to the unique genre-hopping blend of Swing, Blues, Bluegrass and Celtic melody that is the Le Café Jazz signature sound. Le Café Jazz features that redoubtable old-stager from the jazz world, the legendary Clive Morton on double-bass, combined with phantom fiddler Mike Evans, who at the beginning of his career opened the very first Glastonbury Festival with the eclectic rock band Stackridge – and who also spent many years performing Palm Court classics every day of the year (except Christmas Day) while leading the Pump Room Trio in the 1980s in that veritable epicentre of Georgian classical style and taste – Bath. Mike and Clive are joined by versatile jazz guitarist and vocalist Jon Green, who adds American Country and Rockabilly classics to the Swing Jazz mix. The Daffodil began life in the 1920’s as an Art Deco picture-house. In 1998 an award-winning refurbishment took place, and the building now provides a unique and dramatic setting for a stylish restaurant and cocktail bar that retains many of the original Art Deco features. With sweeping staircases and elegant vistas from the mezzanine Circle Bar, a visit to The Daffodil is an experience in itself. Add delicious food and mouthwatering jazz, and you have the recipe for a Saturday lunchtime not to be missed! Enjoy fine food and delightful music in a truly elegant atmosphere at The Daffodil. The Daffodil is located at 8-20 Suffolk Parade, Cheltenham, Gloucestershire GL50 2AE. Telephone 01242 700055 to make a reservation.